Coming to Snowdonia for the first time I was looking for a walk that would give me a flavour of what this area was about. 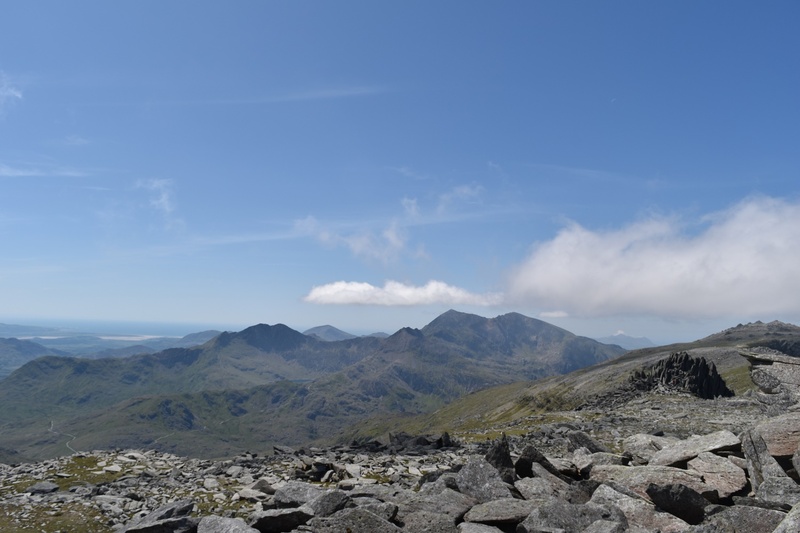 There is the obvious Snowdon walk, or the Snowdon Horseshoe. 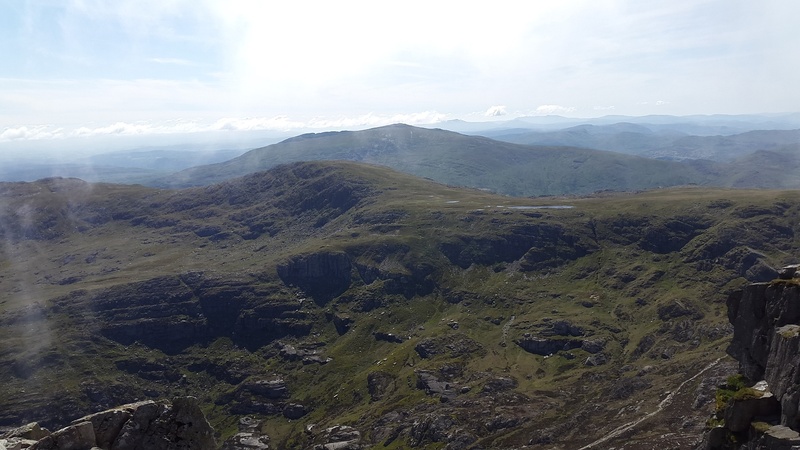 There is the Carnedds or the Glyders or possibly Moel Siabod. 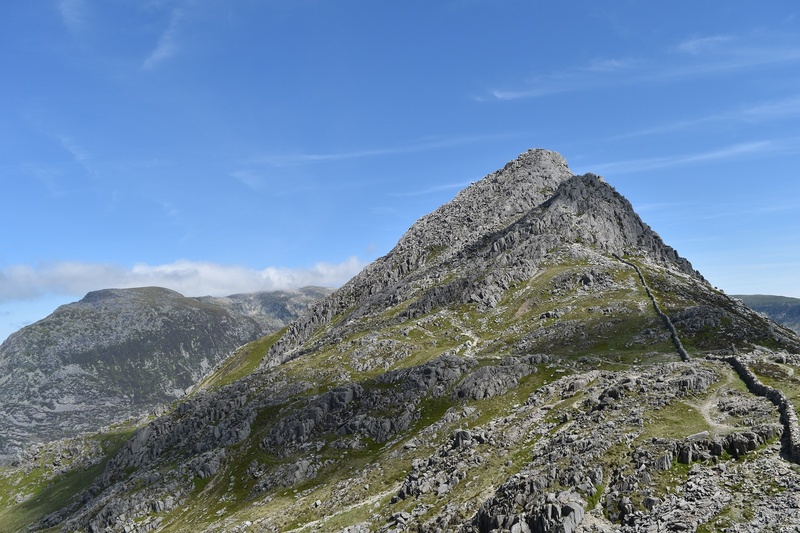 In the end I decided that the Glyders would be my choice and I’d have a look a Tryfan whilst I was there, if I felt good I would head up that way first. The car park was a little quiet when I started and the path up to Llyn Bochlywd empty, which was a little worrying (had I come the wrong way!!) 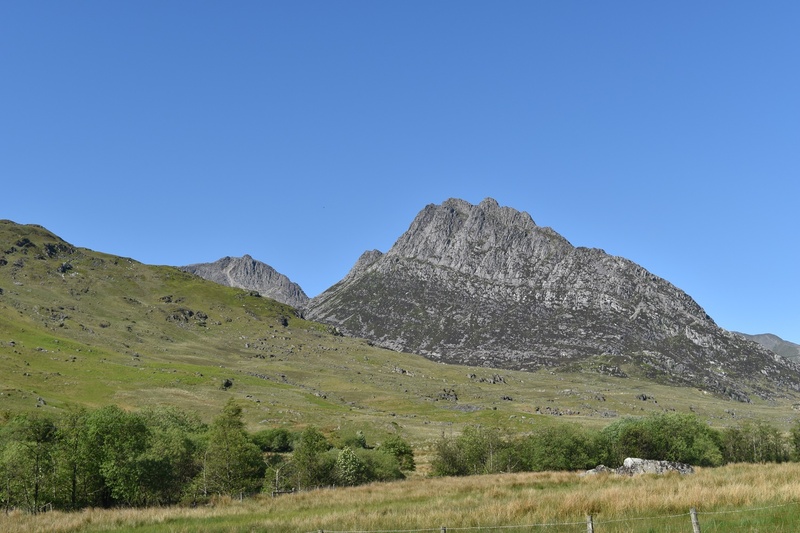 and before long I was stood at Bwlch Tryfan, looking up at Tryfan or turning to look up Bristly Ridge. 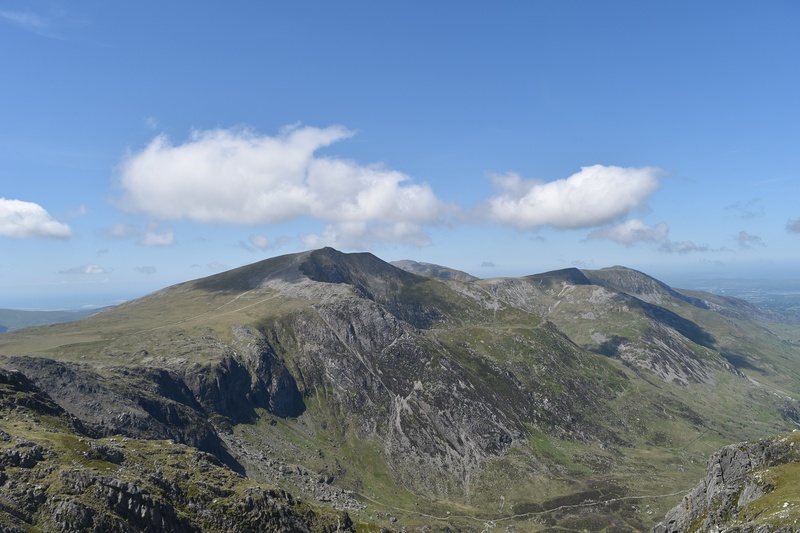 I decided Tryfan would be first, mainly because I couldn’t work out how you got up to Bristly Ridge!!! 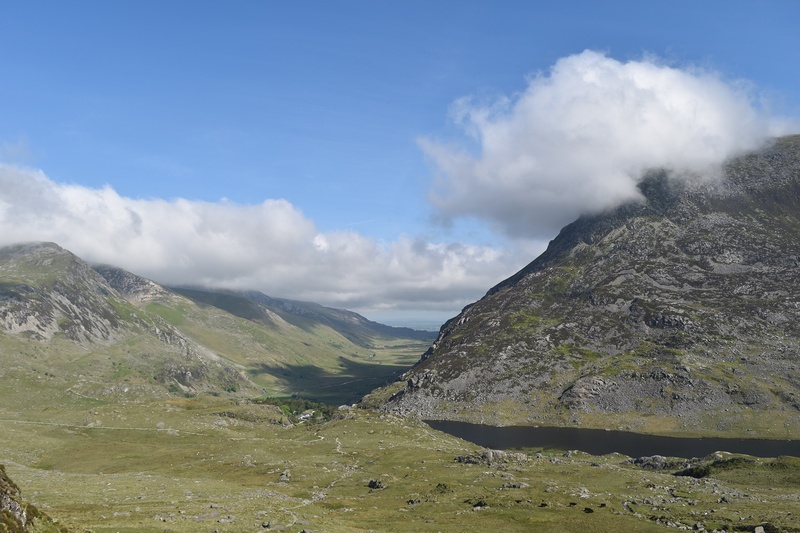 Tryfan was brilliant, its an amazing looking mountain and as tough a climb as you want it to be. Before long I was back at the col (easier to say than bwlch!!) 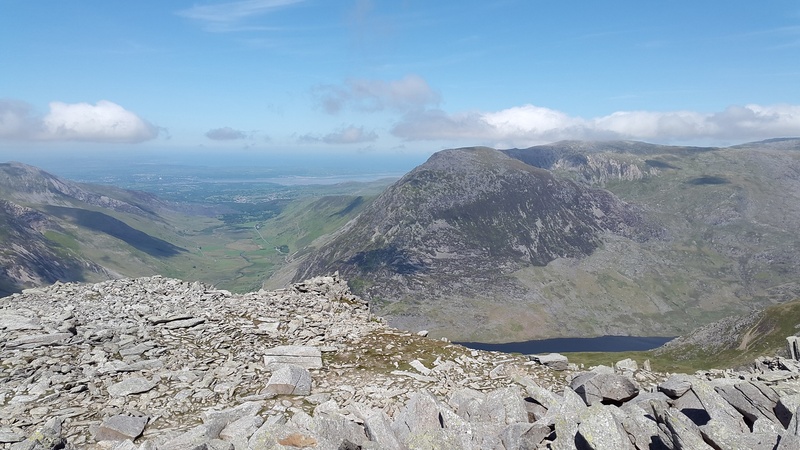 where I was joined by two mountain leaders from the area, I had also met Liz, from Plymouth as well, on the top of Tryfan and all three wanted to head up the ridge. It would be rude not to tag along!! I have to say I wouldn’t have made it up without Linda and Ted, they were brilliant and Liz helped with the hand grabs above me. 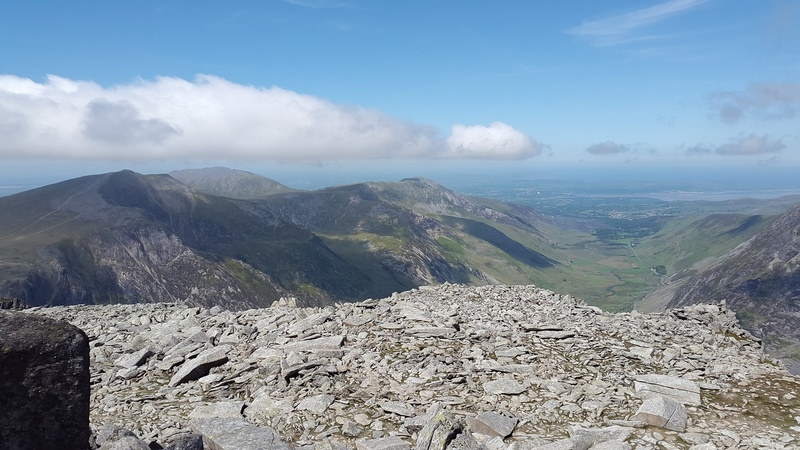 However by the time I’d made the top of Glyder Fach I was done, Linda recommended the descent via Gribben ridge, which was steep and a scramble but a quick way down. 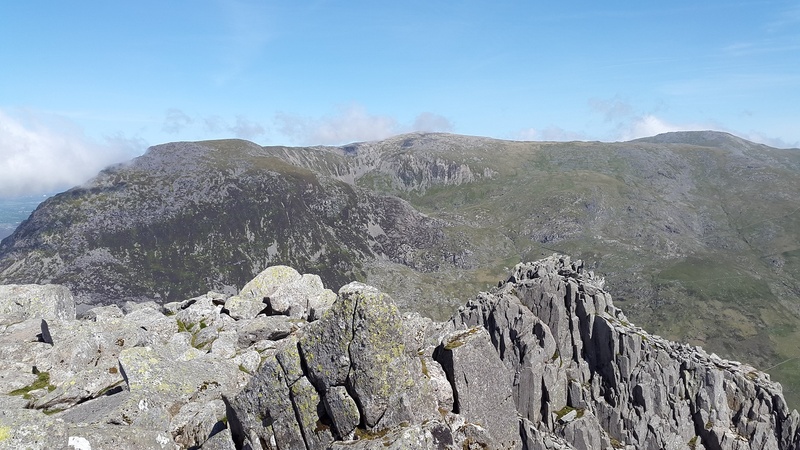 This put paid to my plans of summitting 1000 metres on Glyder Fawr and returning via the Devils Kitchen. 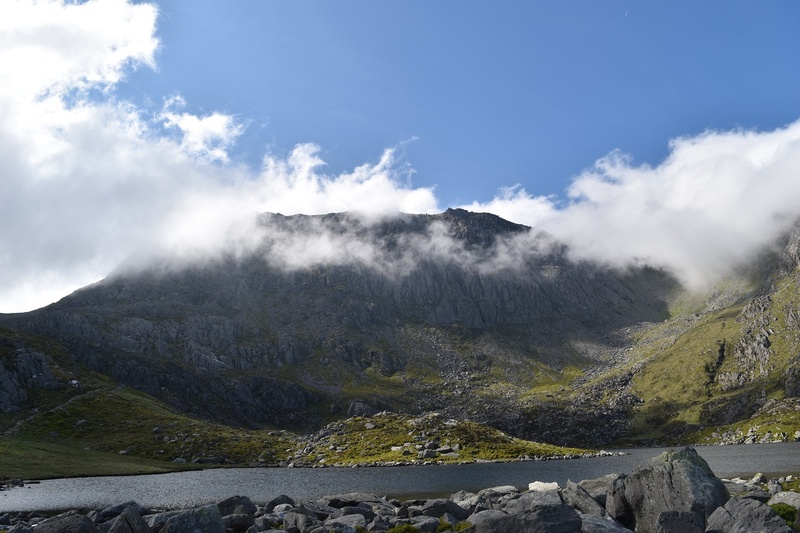 However I returned safe if worn out and Glyder Fawr will be there another day. I have to say, I’ve had a fair few days in the mountains and on the moors of Dartmoor, however nothing prepared me for the amount of leg punishing climbing involved here. I learnt a good lesson in the Glyders to stay within your boundaries and know when you’ve had enough, that said its an amazing place, can’t wait to go back. 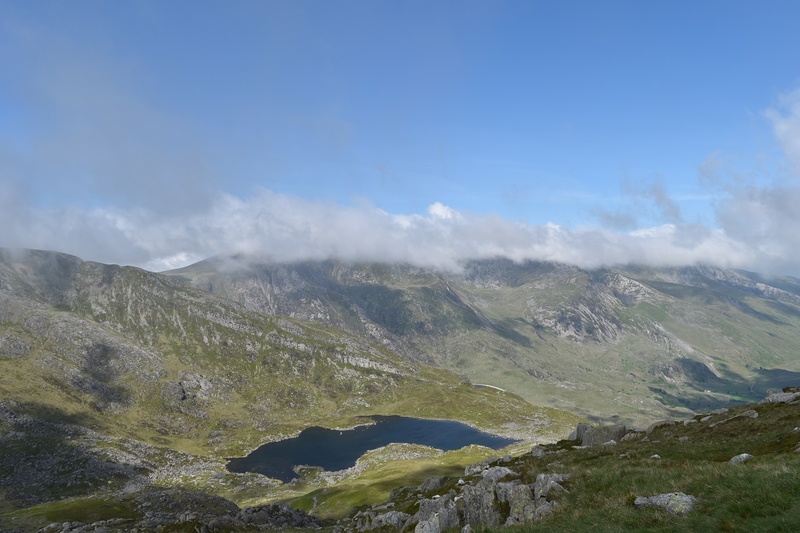 Looking back down the first part, Tryfan behind. At this point I stowed the cameras away as 4 points of contact were needed for most of the rest of the way. Over some extremely steep drops! The Bristly Ridge, the drops in the ridge are tough to get down, although you can traverse around, whilst hanging on above a drop!! A brilliant place! 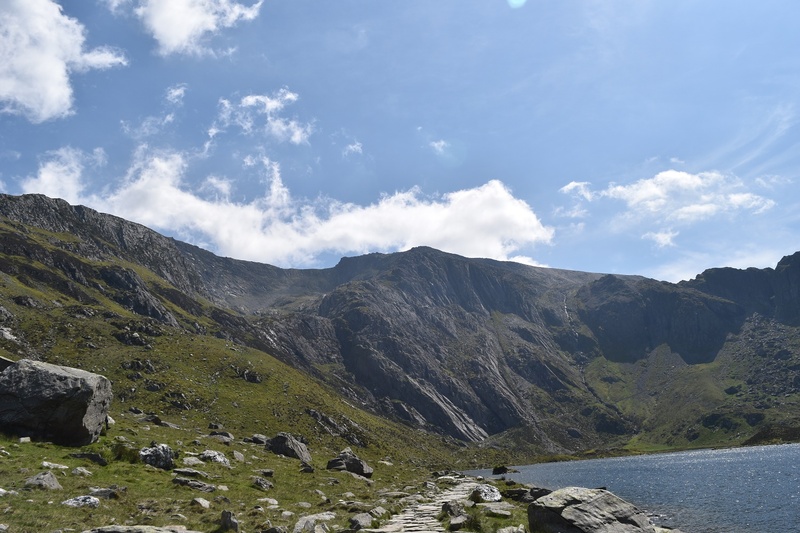 Down at Llyn Idwal with Glyder Fawr towering above. All that was left was the simple walk back to the cottage and the car park. 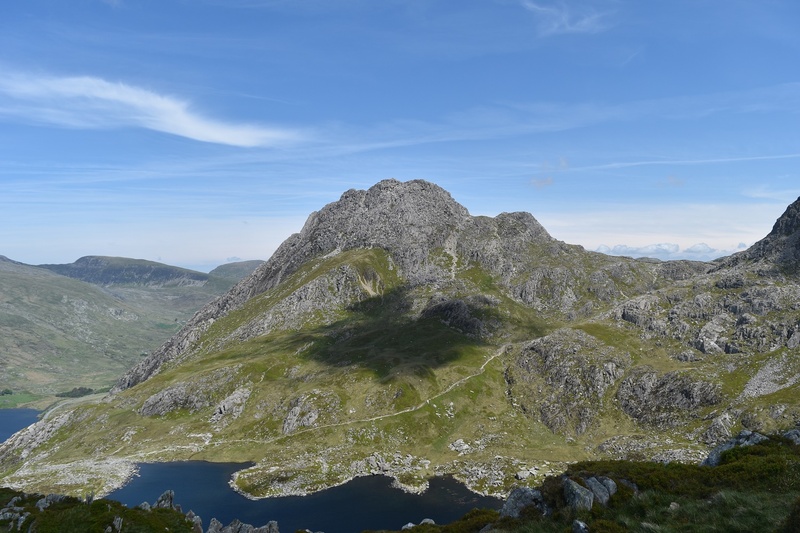 Fab, sounds like it might be the north face of Tryfan soon for you! 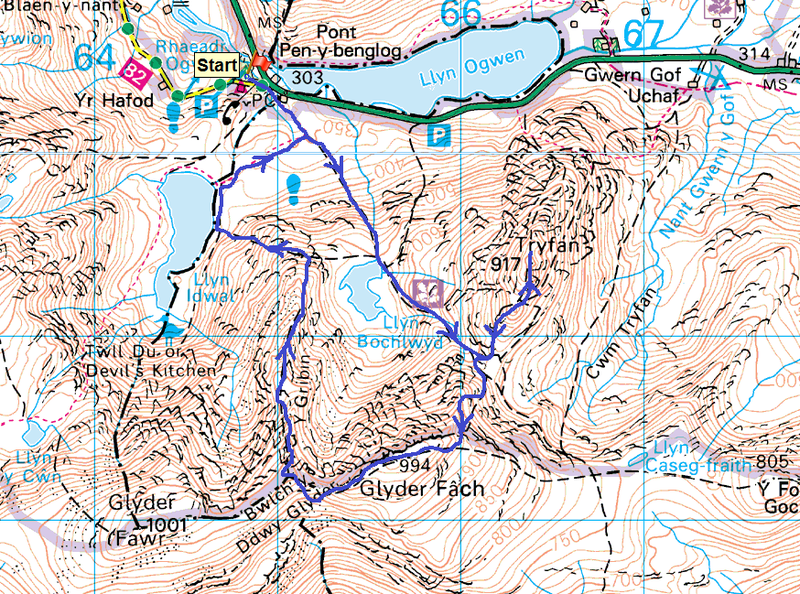 But if so, take great care, some tricky bits: https://jakstrips.com/2013/05/31/snowdonia-may-2013/ Heather Terrace makes a good circular for that. 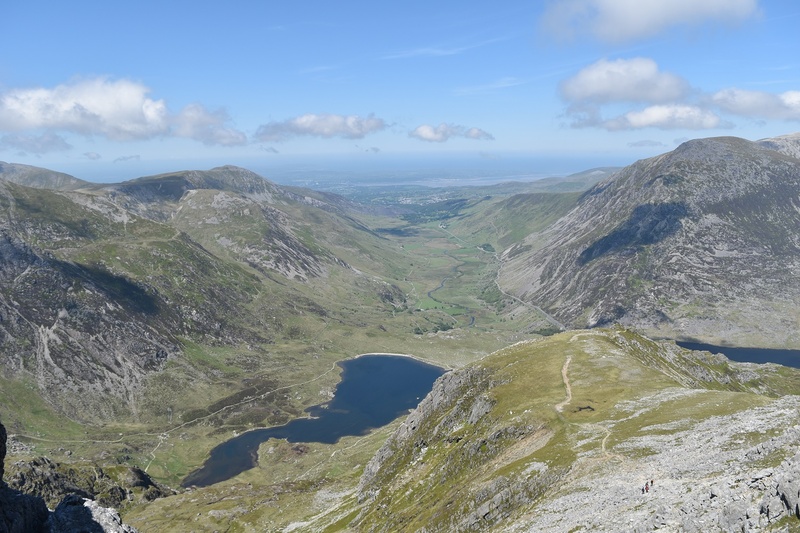 It was fab, I’m definitely going back, the north face of Tryfan will be on the list, I’ll skip Bristly Ridge and walk around via the miners path and hopefully get over to Glyder Fawr next time!! Thanks for the link, always good to see people’s routes up, after all there are so many! What gorgeous views, and your photos are great! I have to admit I find the hike pretty intimidating, although it looks like it would be worth it for those views. The views were amazing and I had to stop and pinch myself a number of times when seeing what I was looking at. Bristly Ridge is punishing on the legs, I got cramp 2/3rds up and had to stop and drink some water and stretch my muscles a fair bit. It seems to go on and on but I’m glad I’ve done it, thankfully I had help on this occasion but if I was alone I would take the longer miners path which heads east and around the bad stuff. Glad you liked the photos although when the scenery is that good it would be hard not to take a good photo! 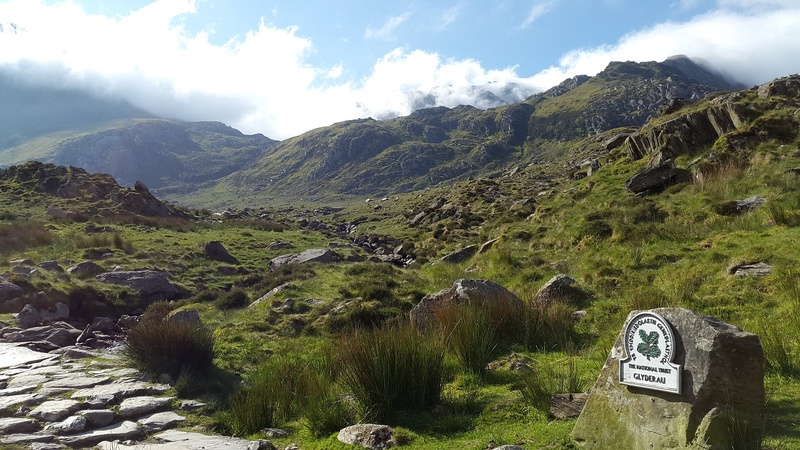 Thanks for the advice, it was a real eye opener to Snowdonia as it was my first visit. It won’t be my last!! 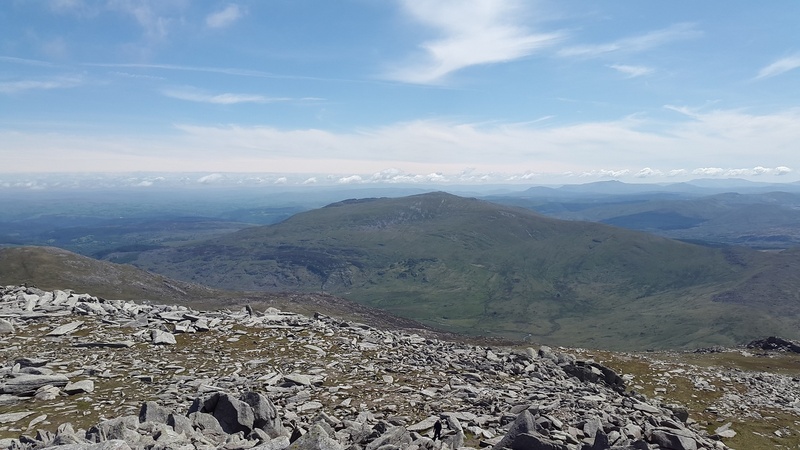 I recently came back from an exhilarating break in Snowdonia where we climbed Snowdon, Carnedd Llywelyn and Y Garn via the Devil’s Kitchen. Like you, I can’t wait to go back and while planning our possible next walks, I came across your website which is great and really informative. 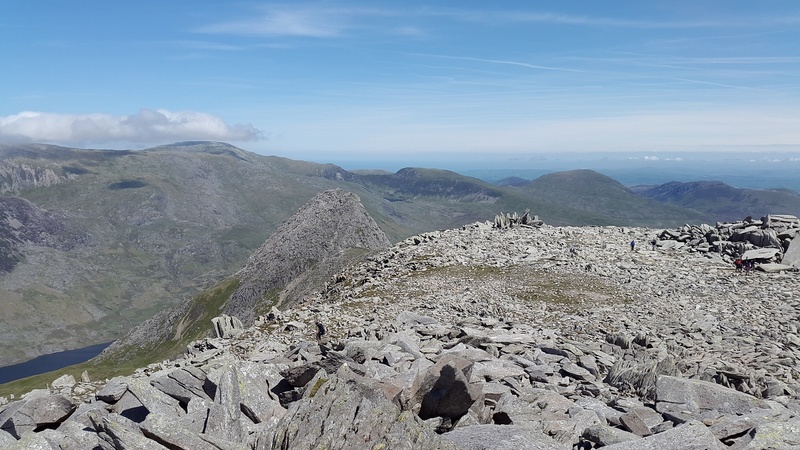 I hope you do get a chance to return and if you do, as you’ve already done the Bristly Ridge and Glyder Fach but you’d still like to reach Glyder Fawr, can I suggest you next take the route we did. 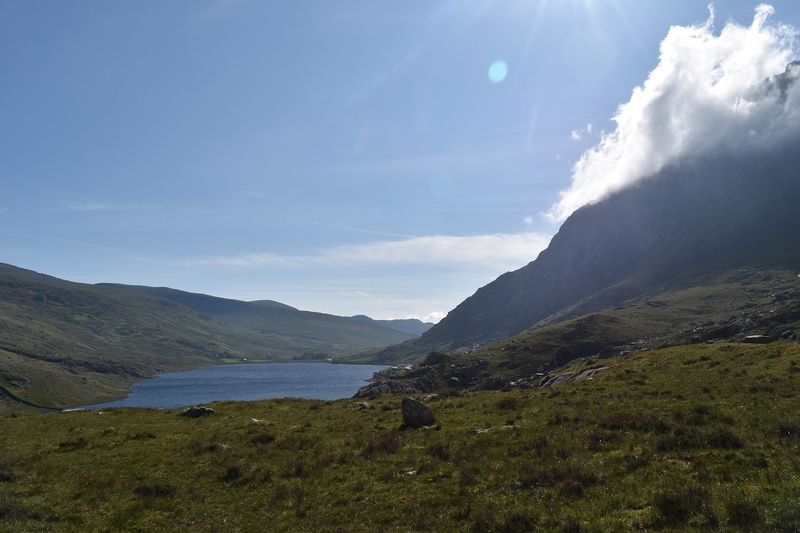 When you reach the top of the cliffs you’ll be richly rewarded with the most idyllic place which is Llyn y Cwn, an isolated and tranquil lake perfect as a resting place. 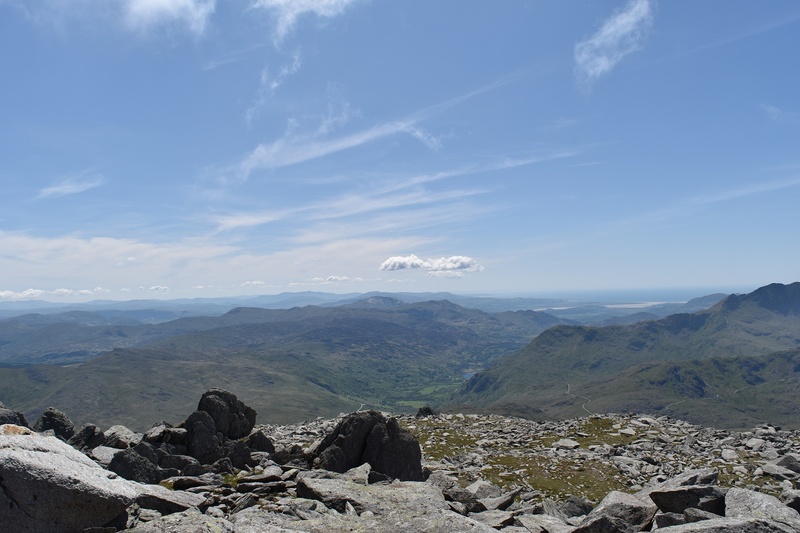 From there you can easily head directly for Glyder Fawr without having to retrace the path you already took previously. Going up and then returning to Llyn y Cwm should take you just over one hour after which you can head directly for Y Garn which is another easy climb. The views looking north towards Anglesey are stunning. From Y Garn you can descend back to Llyn Idwall via the spur heading west past Llyn Clyd on your right. 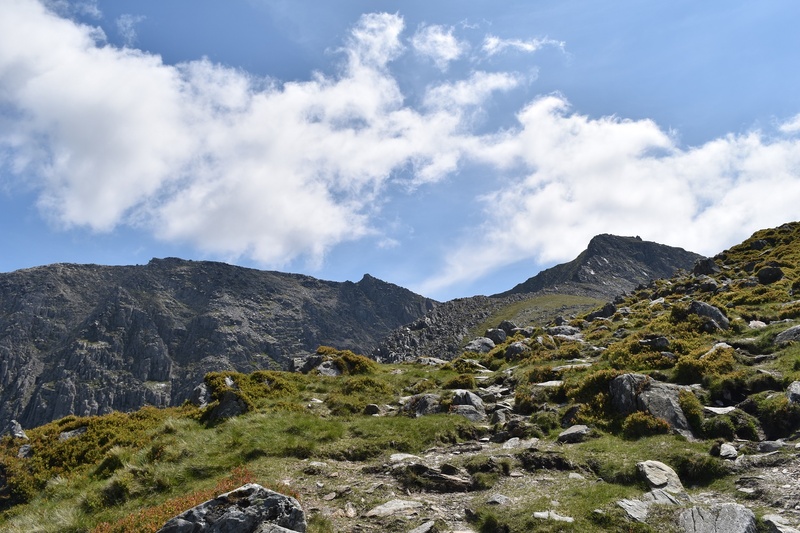 All in all, the only ‘tough’ part is the initial climb up the Devil’s Kitchen and the whole walk should take around six hours. 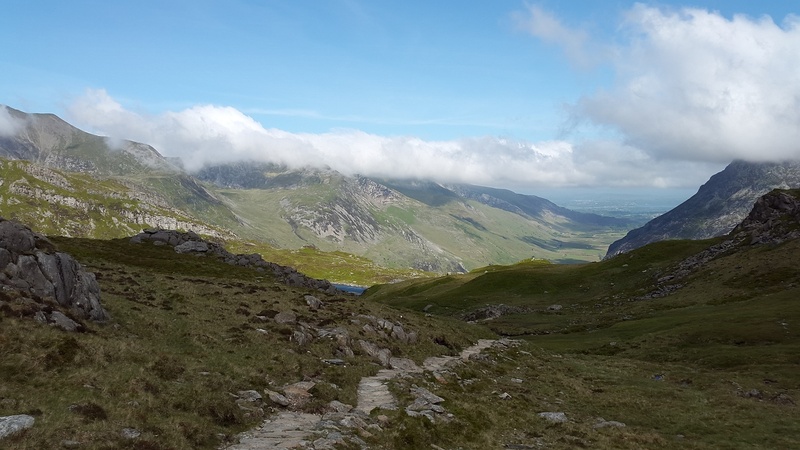 If you are tempted next time to ‘conquer’ Snowdon, I will only say that of the three trecks we did, it was the least rewarding purely because of the hordes of people around you. Hope you get your wish to return !! 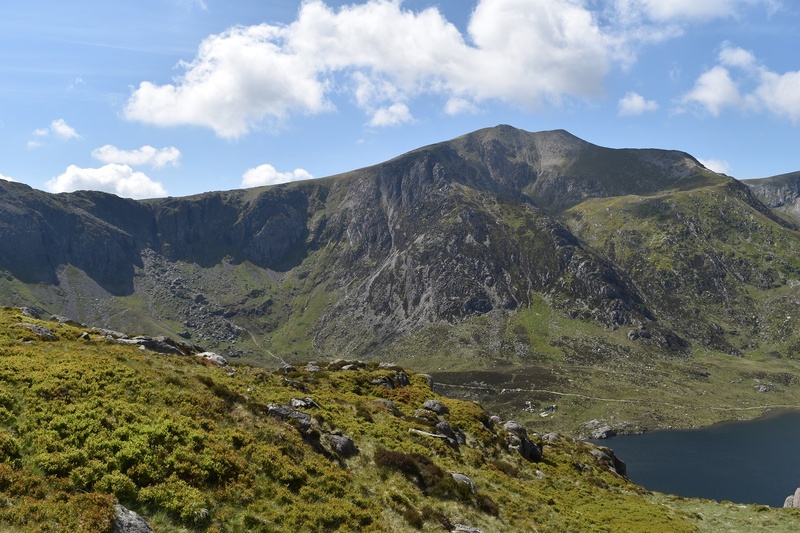 We are planning to next take the route you took from Ogwen Cottage to Bwlch Tryfan (avoid climbing Tryfan) and head for Glyder Fach and Glyder Fawr. The climbing of the Bristly Ridge concerns me as I really don’t have a head for heights. There is apparently a way around the ridge using a scree path to the left of it. Did you see this path and how sheer was the drop beside it? ?I would probably be ok if the drop was at an angle and not ‘straight down’ but I would really appreciate your thoughts on it ! Thank you and happy exploring !! The scree path is obvious. 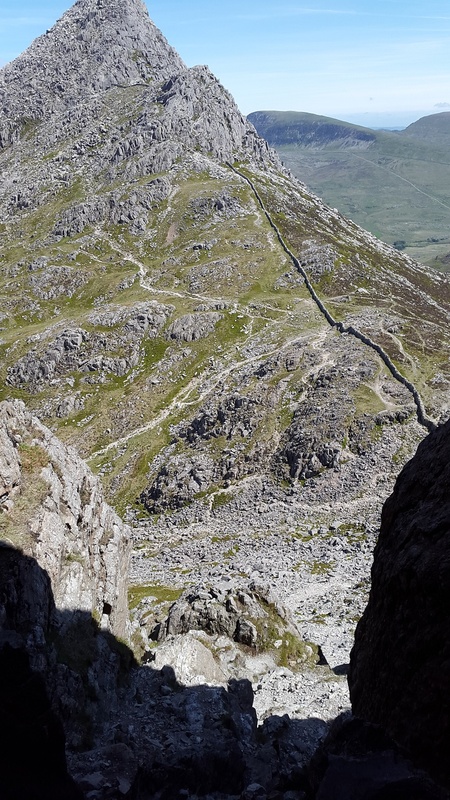 Stand beside the wall and the stile over it and look up, you will clearly see the scree. 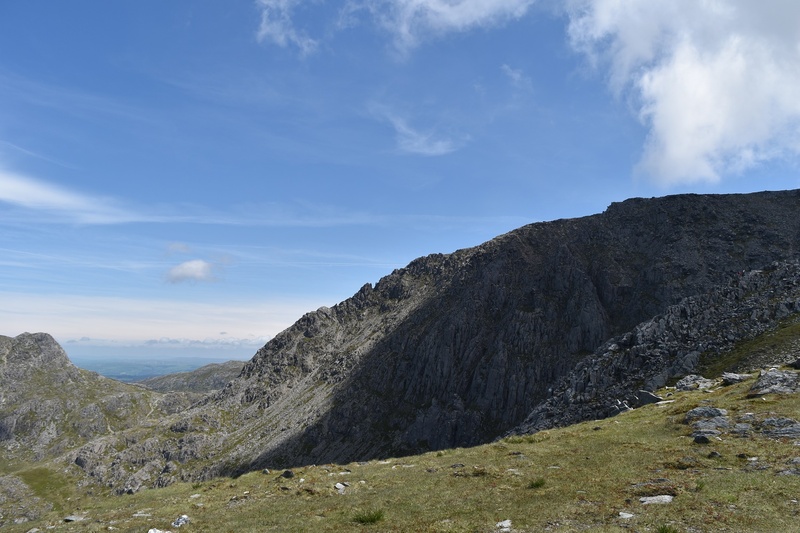 I’ve heard people join the Bristly Ridge from the scree, and the two run parallel so if you fancy doing part of it, it could be possible. Otherwise just follow the scree up the ridge, the drop of to the left is gentle in comparison and not exposed. Having done Devil’s kitchen I reckon you’ll be fine on the scree. 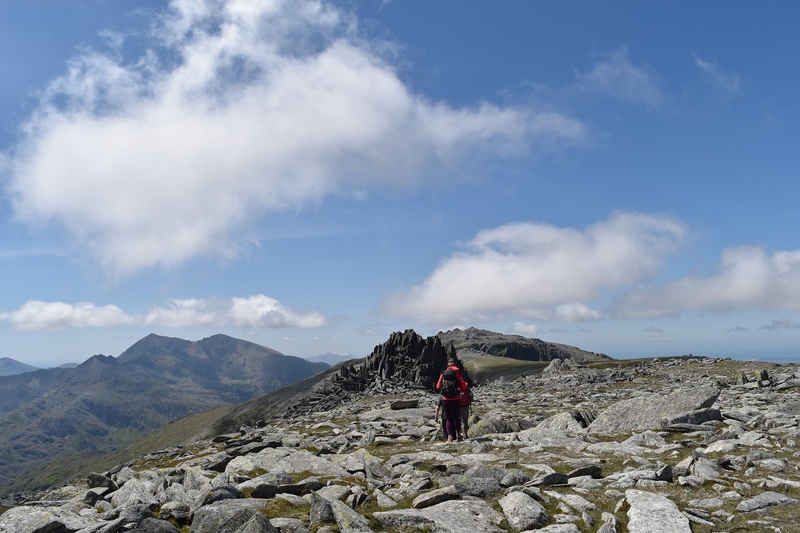 Glyder Fach is a great place, don’t forget the cantilever stone as I did in the haste to reach the summit!! Good luck and thank you for the kind comments. Thank you for your very swift reply…! …and all the detailed info. 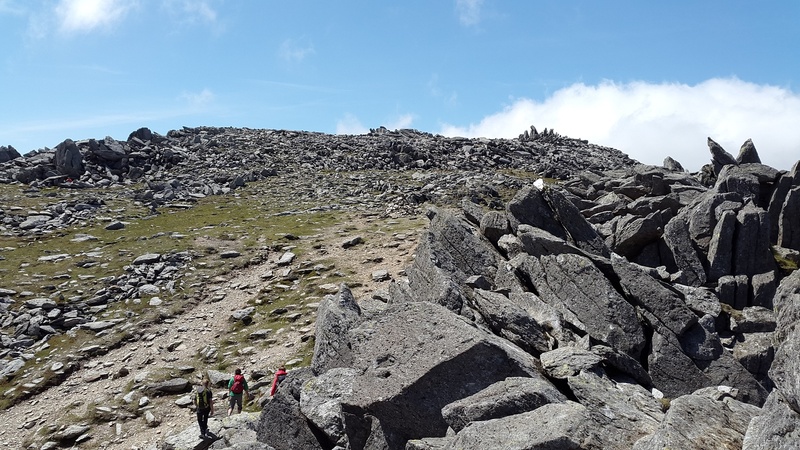 All very very useful and reassuring and with the ridge ‘obstacle’ removed we can only look forward to our next trek to the Glyders and we will of course look out for the Cantilever. I hope you also get a chance to return to enjoy such a great place !! I’m so glad North Wales treated you so well. 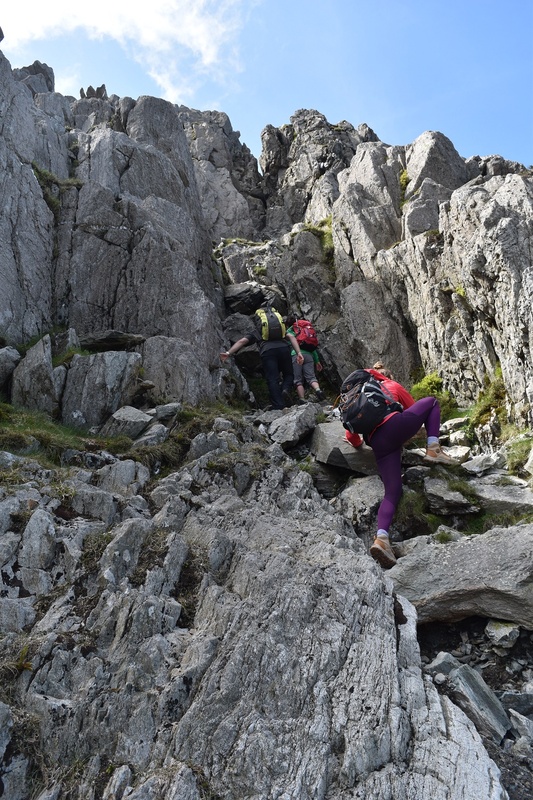 There are some fantastic routes around here, some look easier than they actually are and it’s common for people to misjudge and then rely on MR to come and get them! 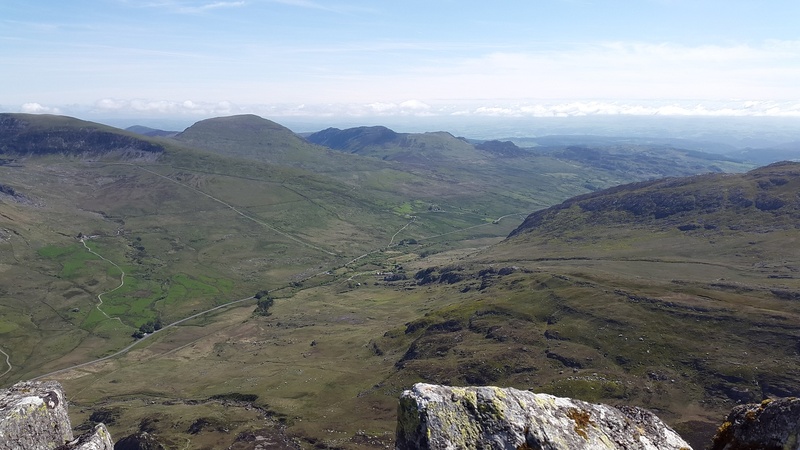 There’s an area called Capel Curig (one of my favorites) which has lovely walks, not as steep as these but you have the likes of mini mountain Crimpiau which offers beautiful views of the Horseshoe etc. Come back soon! I hope you’ll give it a go on one of the easier climbs. 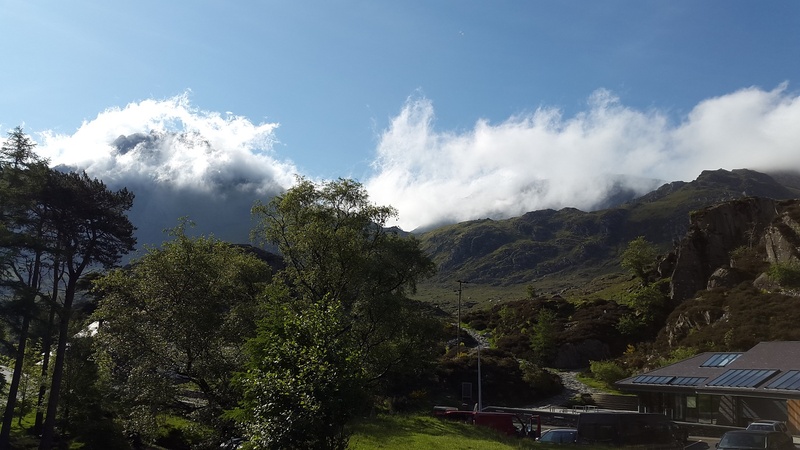 The hike up the Devil’s Kitchen isn’t really so bad…! The reward at the top is a place and a feeling you’ll never forget! 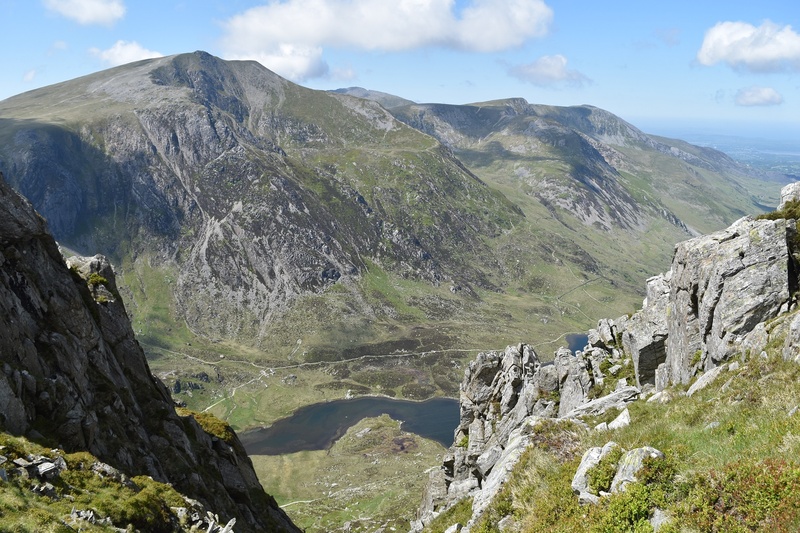 The climb then onto Y Garn is easy and the way down from there so enjoyable if again you take it easy. Hope you get to enjoy it! !